Motor Duty Cycle ratings — Duty Cycle can be thought of as a simplified way of describing how often an electric motor can work. Electric motors can be designed to run all the time, as in a fan or intermittently, as in an actuator. Duty cycle is the ratio of run time to complete cycle time ( run time/ (run time + rest time)) Therefore a 100% duty cycle motor can run continuously whereas a 25% duty cycle motor runs 25% of the entire cycle - 15 seconds run and 45 seconds rest for example. Motors that can start and stop continuously have a premium price, especially at high power outputs. A 100% duty cycle motor sound like a better motor, but if your application does not require that functionality and you have to pay twice the price, or more for it, then it is probably not the motor for you. On/Off ProMation motors have a 25% duty cycle at 65°C. Modulating actuators have a 75% duty cycle at 40°C. On/Off Extended Duty motors have a 75% duty cycle at 65°C. Extended duty motor options are available for P1~P8 (75%) and P9~13 (50%), please contact factory for details and/or restrictions. In many applications we see that a 25% duty cycle motor works extremely well. For example, in an on-off application which cycles approximately once per minute, heat buildup is minimal because the application does not require an actuator to run frequently. For applications that require more frequent position changes, we recommend an extended duty (-ED) motor which has a higher duty cycle, such as a 75% duty cycle for torque ranges from 800 to 13,500 in lbs (P2-P8). 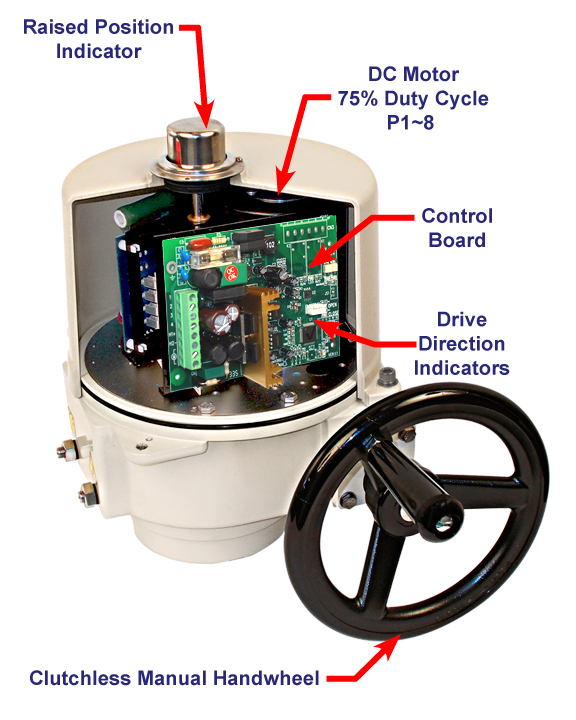 The -ED products feature a 24 or 90vdc motor equipped with an ac to dc converter. The motor to runs cooler for a given output while delivering the same torque ratings as the standard duty cousins. Heat is the enemy of electronic components and motors are no different. High ambient temperatures will decrease the effective duty cycle. Excess heat will eventually break down and damage the varnish on the copper wire windings inside a motor. Once the varnish and windings are degraded, lower torque is generated by the motor and more heat will be produced . ProMation motors have thermal protection circuits that stop the motor after a critical motor temperature is reached, 125°C for AC motors, 90°C for DC motors. Once the temperature is reduced, the motor will operate again. If you have any of these symptoms, give ProMation Engineering a shout. We are here to help and have the solutions you seek.